ATLANTA – Three historically black churches have burned in less than two weeks in one south Louisiana parish, where officials said they had found "suspicious elements" in each case. The officials have not ruled out the possibility of arson, or the possibility that the fires are related. "There is clearly something happening in this community," State Fire Marshal H. Browning said in a statement on Thursday. "That is why it is imperative that the citizens of this community part of our effort to figure out what it is." The three fires occurred on March 26, Tuesday and Thursday in St. Landry Parish, north of Lafayette. A fourth, a small blaze that officials said was "intentionally set," was reported on Sunday at a predominantly black church in Caddo Parish, about a three-hour drive north. "But just as we haven't connected the three in st. Landry, we haven't connected the one in Caddo, ”said Ashley Rodrigue, a spokeswoman for the Louisiana Office of State Fire Marshal, on Friday. Local officials said they were still investigating the fires, and did not say if they knew of any suspects, a motive, or whether racism was an element. The F.B.I. and Federal Bureau of Alcohol, Tobacco, Firearms and Explosives are involved in the investigation, said Jeff Nowakowski, a spokesman for the A.T.F. 's New Orleans field division. The Rev. Gerald Toussaint, pastor of Mount Pleasant Baptist Church in Opelousas, La., Was driving to work on Thursday morning at around 4:45 am. when his wife called him to say she had seen on social media that their church was ablaze. "I'm trying to find out who did it, why they did it, did it have anything to do with me," said Mr. Toussaint, who drives trucks for a living. "I don't know none of this." St. Landry Parish is a rural area with crawfish ponds and bayous in the heart of Cajun and Creole country. It is 56 percent white and 41 percent black. Mr. Toussaint said that relations were generally good between black and white residents. In 2006, a string of arsons at Alabama churches, some predominantly white, some predominantly black, proved to be the work of three college students that officials characterized as a "joke" that had spun out of control. 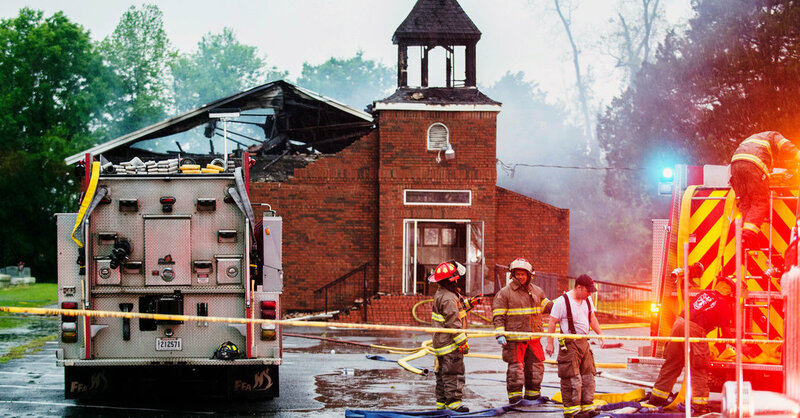 Last month, a black member of a predominantly black congregation, Hopewell Missionary Baptist Church in Greenville, Miss., pleaded guilty to burning his church. The church was sprayed with the words "Vote Trump" in an effort to make the attack seem politically motivated, a Mississippi official said. At the news conference Thursday, Sheriff Bobby Guidroz of St. Landry Parish said that law enforcement officials would do "whatever it takes" to protect churches and churchgoers. "We're doing everything we can, collectively, to solve this crime," he said.